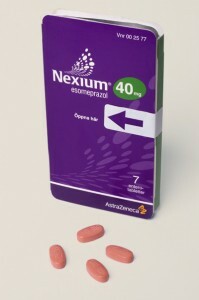 Nexium is the brand name for the generic drug Esomeprazole. It is produced by AstraZeneca and is often marketed as a newer version of "The Purple Pill". Prilosec (Omeprazole), made by the same company, was originally known as the "The Purple Pill". AstraZeneca holds patents on the medication until 2014, due to numerous lawsuits with various generic manufacturers it is not clear when a generic version will be available. Nexium (Esomeprazole) is a proton pump inhibitor, or PPI. Medications in this group of drugs are formulated to decrease the body’s production of stomach acid. This is accomplished by blocking the stomach enzyme that produces acid. Reducing the amount of stomach acid in the body allows the individual’s stomach and esophagus to heal from the painful effects of too much acid. The very mechanism that inhibits the stomach acid also causes side effects that involve both and increase and decrease in the effectiveness of other drugs. Nexium is available in delayed-release capsules of 20 mg and 40 mg for adults. Delayed-release capsules come in dosages of just 10 mg for children. Delayed-release oral suspension capsules of Nexium are available in 10 mg, 20 mg and 40 mg packets. Nexium is most commonly used to treat gastroesophageal reflux disease (GERD) and Zollinger-Ellison syndrome, both of which cause the body to produce an excess of stomach acid. Though Nexium reduces acid and thus aids in the healing process, it is not an effective treatment for immediate relief from heartburn and other discomforts associated with excess acid in the stomach. In some instances, Nexium may also be used as a preventative treatment for gastric ulcers. Proton pump inhibitor medications work by decreasing the amount of acid in the stomach by blocking the acid production site itself. This helps to relieve the symptoms of heartburn and other symptoms associated with GERD. By reducing the amount of stomach acid in the body, it gives the stomach, intestines and esophagus time to heal from the damage initially caused by the stomach acid. For this medication to work effectively, it needs to be taken at least an hour before meals and at approximately the same time each day. This will ensure that levels remain constant in the blood. Patients who suffer from any allergies to ingredients in this drug, have hypomagnesaemia (low magnesium levels in the blood) or any form of liver or kidney disease should inform their doctor before they use Nexium. Although Nexium is an FDA Pregnancy Category B medication, insufficient studies have been done to determine whether it is safe for use during pregnancy or breastfeeding. Patients should always inform their doctor of any other herbal or prescription medications that they may be using before taking Nexium. This will help the doctor to make informed decisions regarding appropriate dosages. Patients should not change their recommended dosage without consulting with their doctor first. If any unusual or unpleasant side-effects are experienced while using Nexium, patients should advise their doctor as soon as possible.